The Union Solidarity & Development Association (USDA) has grown to become one of the most pervasive organizations in Burma, claiming over 22 million members (nearly half the country's population). Very little is known of the USDA to the outside world, but it has become imbedded throughout the social infrastructure of the state. It's widely published statutes expressing the importance of state sovereignty and public solidarity can be found in all mediums throughout the country: newspapers, television, billboards and radio broadcasts. Known as the "Three Main National Causes", "Four-Point People's Desire", "Seven Point Road to Democracy" and "Twelve Political, Economic and Social Objectives", each broadcast day begins with their recitation. 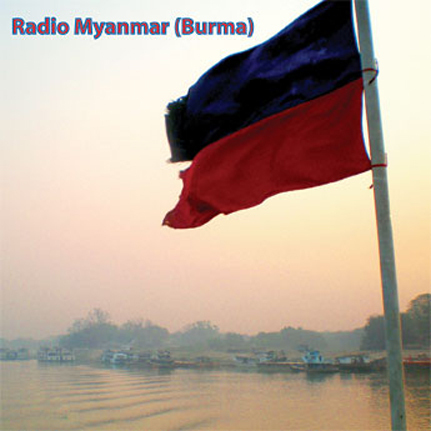 Most of the recordings featured in this radio collection were captured in Yangon during March and April of 2007. With the authorities attempting to control all information coming into or leaving the state, rarely does the world catch a glimpse inside Burma. This is a special opportunity for listeners to delve behind the headlines and into the airwaves; to hear for themselves the sounds, rhythms, and voices of urban Burma's radio experience, unfiltered by the international press or state-spokesmen. Myanmar's Voice broadcasts nearly twenty-four hours a day across much of the country, playing an assortment of Burmese classics; USDA pledges; and recitations of articles published by the state-run The New Light of Myanmar Times. Due in part to the near blackout of all foreign music on state airwaves, the few FM stations that do exist in Yangon and Bago divisions, transmit a rather bizarre assortment of music from 7am to 9pm: synth ballads, hip-hop jingles, and internationally popular songs re-recorded in Burmese. This release also features assorted tracks recorded between 1994-2002 highlighting many wonderfully strange and beautiful pop, folk, and classical music styles. There are vast resources easily available to anyone interested in learning more about Burma or the USDA; this recording is simply intended to showcase the extraordinary sounds rarely heard beyond its borders.